More than 437 billion people speak Spanish as their native language. Spanish is the official language of 20 countries, including most of South America, Spain and Equatorial Guinea in Africa. To keep the Spanish language uniform and organized, the existence of the Real Academia Española (Royal Spanish Academy) became necessary. Along with 21 other academies and institutions, they govern, if you will, the Spanish language. Besides publishing dictionaries and grammar guides, they also have a say on which letters make it into (or are cut from) the official Spanish alphabet. Let’s start at the beginning, the ABCs of Spanish alphabet letters. Ask any English speaker, and they can tell you resolutely that there are 26 letters in the English alphabet (they might sing a song about it). However, asking, "how many letters are there in the Spanish alphabet" can get you an answer anywhere between 25 or 30 depending on whom you ask. What gives? Not to worry, the Royal Spanish Academy has got us covered: there are officially 27 letters in the Spanish Alphabet. All the letters that are also present in the English alphabet are present in the Spanish one, along with the addition of the letter ñ. So why the confusion? K and W are not Spanish letters. 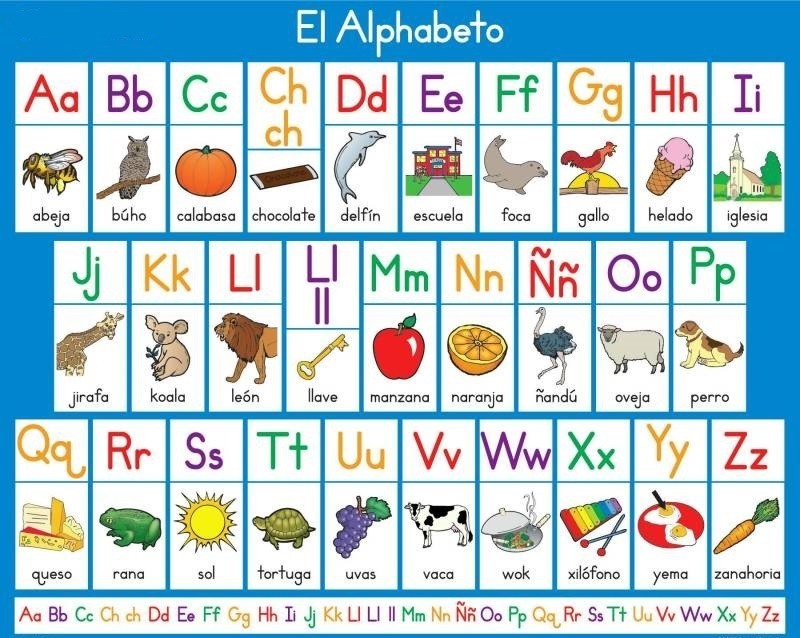 Yes, they are in the official alphabet, but no original Spanish word uses these letters. In fact, w is foreign to most romantic languages including Spanish, Portuguese and Italian. Purists, therefore, do not consider them part of the Spanish alphabet (ergo: 25 Spanish alphabet letters). We can see some evidence of this in the fact that, W especially, has different names. Depending on the country you’re in the W is can be called: doble ve, ve doble, uve doble, doble uve or doble u. Since the W isn’t an original Spanish letter, most Spanish speakers will not pronounce the W the same as English speakers might. In most cases the pronunciation is somewhere between a G and a W, for example, Sandwich is most commonly pronounced as Sandguich. In 1994 the Royal Spanish Academy announced that LL and CH were no longer official Spanish letters. At the time, it was mostly applied in computer sciences, where it was no longer necessary to write special exceptions into software that relied on an alphabetical organization or data. The change attracted a lot more attention in 2010 when the Royal Spanish Academy published their new and revised spelling manual. The Royal Spanish Academy started considering the CH and LL as digraphs (two consonants that together make a new sound) instead of actual letters and thus removed them from the Spanish alphabet. Anyone who learned their Spanish ABCs before 2010 and especially before 1994, learned 29 Spanish alphabet letters, that included the CH after C, and the LL after L.
While the history of the inclusion and subsequent exclusion of the letters LL and CH is known, the history of RR is more muddled. Some sources say that the RR hasn’t been considered an official Spanish letter since the 1800s. The confusion originates from the fact that the single R and the double RR have very different sounds in Spanish and can alter the meaning of the word. Consider for example Pero (but) or Perro (dog). Not to mention the fact that rolling R sound of the double RR is a famous and very recognizable and distinct Spanish sound. This leads many to consider the RR as a distinct letter, thus bringing the alphabet to a potential 30 letters in total, before CH and LL where removed. However, since words in Spanish can't start with an RR, it's not considered to be a letter officially and therefore not included in the official Spanish alphabet. Ñ is probably the most well-known letter in Spanish. In fact, it can be said that the ñ is the only Spanish letter with true Spanish origin. Like most romantic languages, the Spanish alphabet originated from Latin (the language of the Romans). In medieval times, scribes started writing Latin words with two n’s (like annvs and canna) with one N on top of the other, probably to save space since parchment was expensive. Over time the N on top became smaller and smaller until it turned into the squiggly line we use today. As Spanish moved away from Latin phonetically, the ñ started being used to indicate the new “eñe” sound that did not exist in the original Latin. So, annvs (Latin for year) became año and canna (Latin for cane) became caña. In other words, the Ñ became a new formal letter that is particular to the Spanish language. Some people are proposing the exclusion of the letter H from the Spanish alphabet, most notably the renowned Colombian novelist, Gabriel Garcia Márquez. Similar to other consonants, the pronunciation of H has become softer over time. In the case of the letter H however, it has gone so far as to make it inaudible. When a word does not start with H, the letter H is used to make the pronunciation of strong vowels easier, as in the word ahí (there). But H has no sound of its own. Leaving many to wonder why it is even there in the first place? The reason is probably etymology or the history of a word. Much like the unsounded K in the English word "Know." It is there because it's always been there. It does make us wonder if the Royal Spanish Academy might exclude it from the official Spanish alphabet at some point, leaving us with 26 official letters of the Spanish alphabet. Anyone who is learning Spanish or considers it their native language knows a true and odd fact about these two letters in Spanish. There are pronounced the same. Since the English V sound (such as in victory) doesn't exist in Spanish, the pronunciation of these two letters is indistinguishable. Obviously, this can lead to confusion about the spelling of words. While the general rule is that the V is used to separate vowel sounds and the B is after consonant sounds or at the beginning of utterances, the confusion is prevalent. For example, Ceviche can be spelled with a V or with a B, as in Cebiche, and both are correct. When spelling the B can be called: be, be grande or be larga. Similarly, the V can be called: ve, ve chica or ve corta. With so much ambiguity, many have taken to calling B the “B de burro," referring to the letter used in spelling the word burro (donkey), and V the “V de vaca," referring to the letter used to spell the word vaca (cow). Hopefully, you have a deeper understanding as to what the Spanish alphabet consists of, so you can easily pick up on learning the Spanish language.